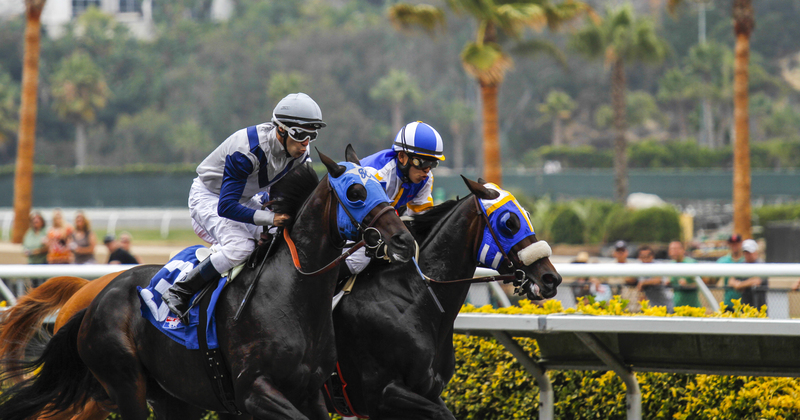 Kongo headed to Del Mar this afternoon to watch the horse races. 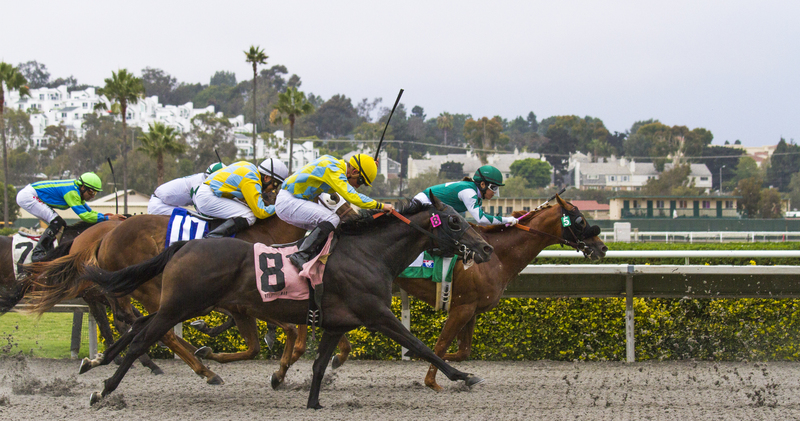 The Del Mar Race Track, “Where the surf meets the turf,” is only a few hundred yards from the ocean. 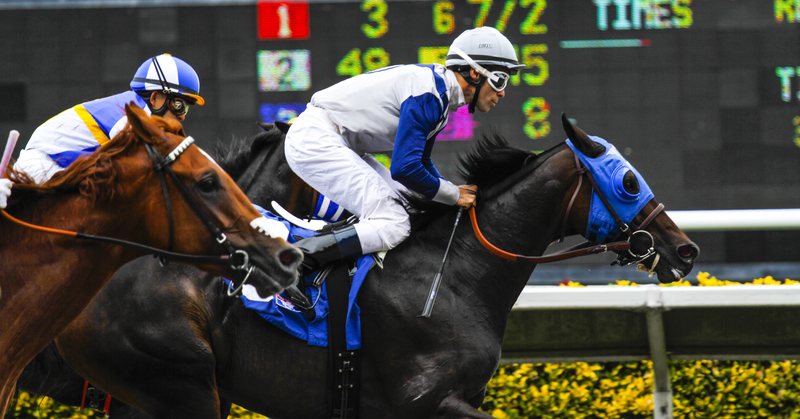 Racing season runs from mid-July to Labor Day. When the track first opened in 1937 then owner Bing Crosby was on hand to greet all the guests. 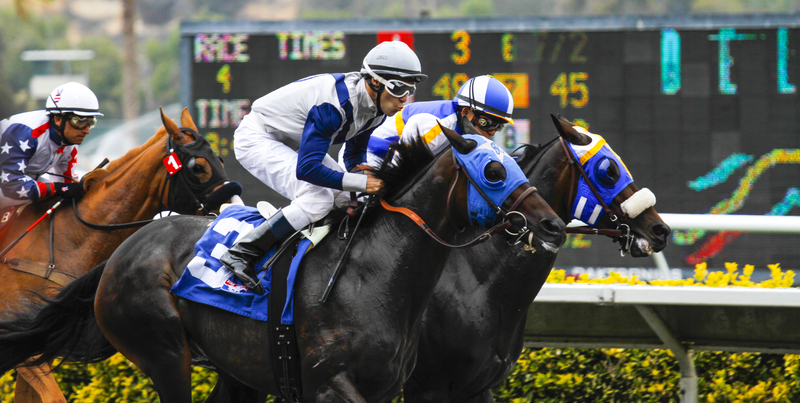 One of the most famous races held on the track was in 1938 when Seabiscuit bested Ligaroti by a nose. The race was broadcast to a nation-wide radio audience. In the 1930s-40s Del Mar was a favorite summer spot for Hollywood greats who would spend the evenings at the Hotel Del Coronado then make it up to Del Mar for the races. Kongo didn’t see any stars today except when one woman (with a hat of course) jumped in front of him (Kongo was literally leaning over the rail) to stick an iPhone in front of him while he was snapping the finish of a race. She also stomped on his foot at the same time. She was a bad little monkey! (你好 ni hao!!) He gave her his best angry monkey glare and she slinked away. Anyway, he got some good action photos of some of the races from a safer spot. 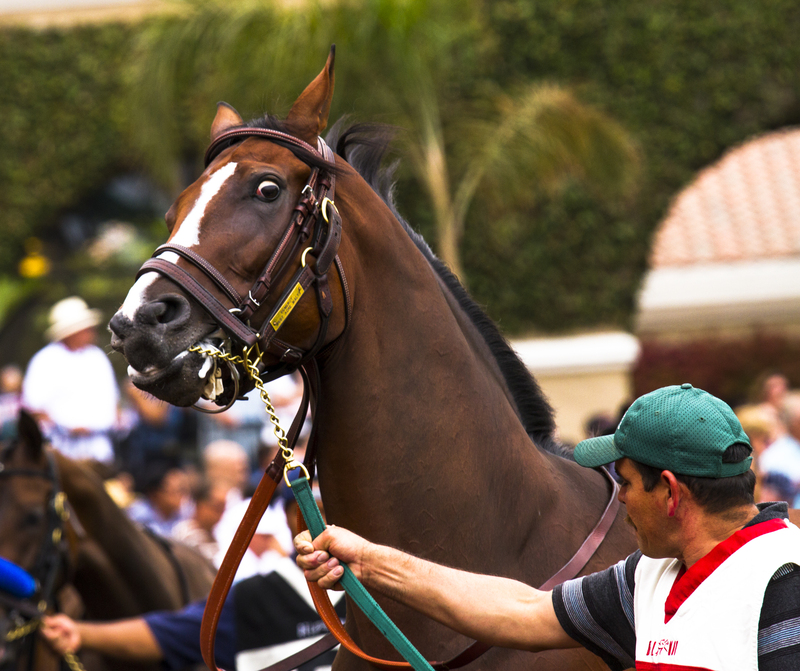 In the paddock parade this horse got a little spooked. Hopefully, it wasn’t the monkey that got to him. He lost his race. 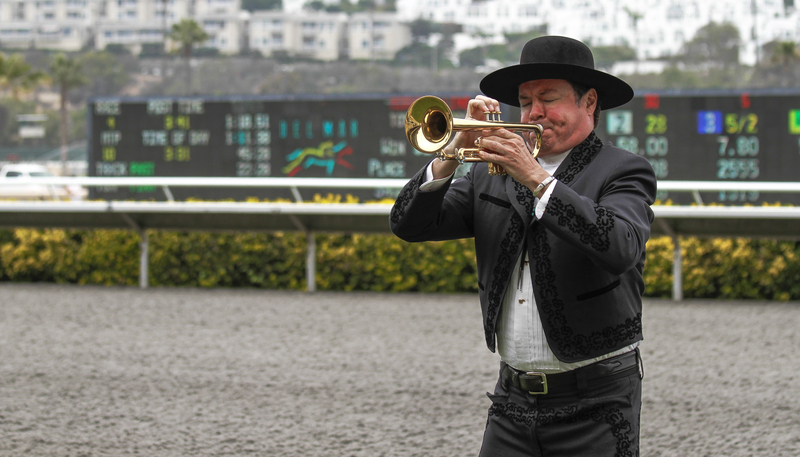 The bugler calls each race with the classic race melody. 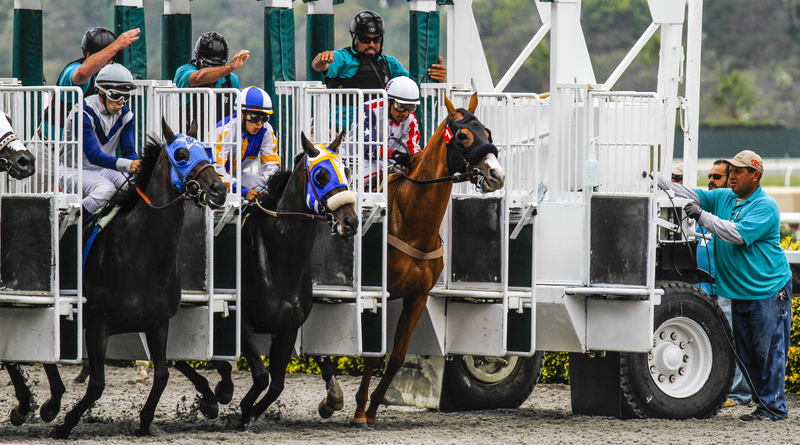 The races are open every day except Monday and Tuesday. Gates open at noon and the first race is at 2 PM. Admission to the track starts at $6 and parking is $10. Frequently there are concerts after the races. Check out the schedule here. Travel safe. Have fun. Good luck! Thanks, Cindy. I had fun. It’s been decades since I went to the races. They’ve become very colorful and you did a great job capturing it. Next time I’ll concentrate on hats. There were lots of women in hats. Now, try to imagine what kind of back tattoo goes best with a hat. It was that kind of day. Great shots, so clear and sharp! Wow! Some great shots! Well caught! Great shots Kongo. I know this track well and it looks like you had it scoped out pretty well. I am sure your new 70-200mm got some heavy use. I have shot 3 – 4 times the last three seasons, but have not had a chance to make it out this year yet. Thanks, Mark. I would have preferred a sunnier day but this worked fine.